Every cell in the human body is rigorously and tightly regulated with respect to growth, interaction with other cells and even its lifespan. These cells are the building blocks of the body. Normally, new cells form as and when you need them, often replacing old cells which die. Unfortunately, this process sometimes goes wrong. In such circumstances, new cells form though you do not need them and old cells do not die when they should. Extra cells can form a tumour. In some cases, the extra cells form benign tumours which are not malignant while others lead to dreaded cancers. Malignant tumour cells can invade nearby tissues or break away and spread to other parts of the body. Cancer occurs when a type of cell has lost its deference and subservience to the normal controlling mechanisms of growth and multiplies in a way that the body can no longer regulate. These cells become a sort of a law unto themselves. Different kinds of cancers have different signs, symptoms, treatments and outcomes, depending on the type of cell involved and the degree of uncontrolled cell growth. Some cancers grow slowly while others proliferate at an alarmingly rapid rate. Children can and do get cancer in the same parts of the body as adults. However, there are differences. Some childhood cancers can manifest quite rapidly, without early symptoms, but may exhibit higher rates of ‘cure’. The most common children’s cancer is leukaemia which is a form of blood cancer. Other cancers that affect children include brain tumours, lymphomas, bone malignancies and soft tissue sarcomas. Some cancers in children develop from primitive cells which are found only in the foetus under normal circumstances. All childhood cancers have a common disease process with the cells growing out of control and developing abnormal sizes and shapes, ignoring their typical boundaries inside the body, not obeying overall controlling mechanisms, destroying their neighbouring tissues and ultimately spreading to other organs and tissues. As cancer cells grow, they demand more and more of the body’s nutrition. Cancer takes a child’s strength, destroys organs and weakens the body’s defence against other illnesses. Symptoms and treatment depend on the cancer type and how advanced it is. Treatment may include surgery, radiation and/or chemotherapy. Typically, the factors that trigger cancer in children are usually not the same factors that may cause cancer in adults such as smoking or exposure to environmental toxins. Rarely, there may be an increased risk of childhood cancer in children who have an abnormal genetic condition such as Down syndrome. Those who have had chemotherapy or radiation treatment for a prior cancer episode may also have an increased risk of cancer. In almost all cases, however, childhood cancers arise from non-inherited mutations or changes in the genes of growing cells. As these errors occur randomly and unpredictably, currently there is no effective way to prevent them. In more recent years, childhood HIV/AIDS has become a significant underlying cause for the development of certain types of childhood cancer. Sometimes, a doctor may be able to spot early symptoms of cancer at a regular check-up. However, some of these symptoms such as pain, fever, swollen glands, frequent infections, anaemia or bruises are also associated with other conditions that are not cancer. Because of this, it is common for both doctors and parents to first suspect other childhood illnesses when cancer symptoms first appear. However, like in most other diseases, early diagnosis definitely facilitates treatment and improves the prospects of a permanent cure. The diagnosis and treatment of childhood cancers may take a little time and there are both short-term and long-term side effects of the treatment modalities. But thanks to medical advances, more and more children with cancer are finishing successful treatment, leaving hospitals and growing up just like everybody else. Today, a very significant and considerably large proportion of all children with cancer can be helped. 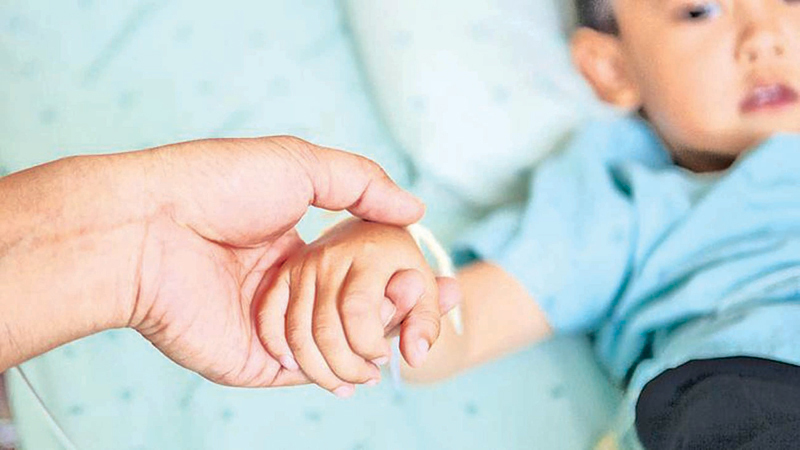 The treatment of cancer in children can include surgery to remove the tumour, chemotherapy, which is the usage of medical drugs to kill cancer cells, and radiation, which utilises radiant energy to kill cancer cells. The exact forms of treatment needed depend on the type and severity of cancer and the child’s age. For children with leukaemia or lymphoma, surgery generally plays a minor role. This is because leukaemia and lymphoma involve the circulatory system and lymphatics respectively. These are two systems that are widespread throughout the body, making it difficult to treat by surgically operating on one specific area. In children with osteosarcoma or bone cancer and other solid organ tumours that have not spread to other parts of the body, surgery can often effectively remove the cancer and when used in combination with chemotherapy and/or radiation, a very satisfactory outcome could be expected. Children with certain types of cancer may need to receive bone marrow transplants. Bone marrow is a spongy tissue inside certain bones of the body that produces blood cells. If a child has a type of cancer that affects the functioning of blood cells, a bone marrow transplant, in conjunction with chemotherapy to kill the defective cells, may allow new and healthy cells to grow. Bone marrow transplantation is also sometimes used to treat cancers that do not involve blood cells because it allows doctors to use higher doses of chemotherapy than would otherwise be tolerated. Bone marrow transplants are expensive, need sophisticated infrastructure facilities and treatment with ancillary drugs which need to be continued for a very long time. Chemotherapy is the use of certain medications as a complementary tool to eliminate remaining cancer cells in the body. A child or teenager with cancer is usually given the chemotherapy drugs intravenously (through a vein) or orally (by mouth). The drugs enter the bloodstream and work to kill cancer cells in parts of the body to which cancer has spread. Some forms of chemotherapy can also be given intra-thecally (into the spinal fluid). The duration of chemotherapy treatment and the type of drugs that are used depend on the type of cancer the child has and his or her response to the drugs. Every child’s treatment is different and a child may receive chemotherapy treatments daily, weekly or monthly. The doctor may also recommend cycles of treatment which allow the child’s body to rest between periods of chemotherapy treatment. Many of the medications used in chemotherapy also carry the risk of both short-term and long-term side-effects and other problems. The short-term side effects include nausea, vomiting, hair loss, fatigue, anaemia, abnormal bleeding and increased risk of infection due to the destruction of the bone marrow as well as kidney damage and menstrual irregularities. Some drugs carry a risk of bladder inflammation and bleeding into the urine, hearing loss and liver damage. Others may cause heart and skin problems. The long-term undesirable effects can include infertility, growth problems, organ damage and increased risk of other cancers. These are of considerable concern in the treatment of childhood cancer. Doctors do take as much care as possible to avoid or counteract as many of the side-effects as possible, but in certain circumstances, these undesirable effects may be quite unavoidable. Radiation is one of the most common treatments for cancer. A child who receives radiation therapy is treated with a stream of high-energy particles or waves that destroy or damage cancer cells. Many types of childhood cancers are treated with radiation in conjunction with chemotherapy or surgery. Radiation has many potential side-effects inclusive of increased risk of future malignancies and infertility. These need to be comprehensively discussed with the parents. All forms of treatment for childhood cancers are available in our hospitals free. However, in certain types of cancers, it may be necessary to get down some special drugs from other countries. These will obviously cost a lot of money and the government makes every effort to get them down for needy patients. The primary goal when treating children with cancer is to cure them and this takes priority over all other aspects of care. However, there are many other medications and therapies that can make children more comfortable while undergoing treatment for cancer. Whenever possible, older children should be involved with their own cancer treatment. Facts about the specific type of cancer and its effects should be explained in language that is suitable for the child’s age level. However, when cancer affects younger children, especially toddlers and those younger than age four, simply telling them that they are ‘sick’ and need ‘medicine’ to get better is often enough explanation. For all age groups, the goal is to prevent fear and misunderstanding. Although some conditions that are associated with malignancies in children are known, the exact cause for the emergence of such cancers is not quite clear. In other words, the root cause of cancer has not been recognised to the present day. In that background, one cannot have specific therapeutic measures that could ‘cure’ the disease, once and for all, in the same sense that an antibiotic is able to cure pneumonia. However, in certain solid organ tumours, complete removal at surgery is likely to lead to a complete cure. Childhood malignancies are best treated by a multi-disciplinary team consisting of representatives of the different specialities that would be intimately involved in the care of the child. It is definitely a shattering and devastating experience for any parent to be told that his or her child has cancer. They will take time to get used to the idea and will need considerable support and clear explanations of the implications of the diagnosis. The different modalities of treatment should be carefully and slowly explained to them, preferably in non-medical jargon. Some parents may have guilt feelings as to whether they themselves are at fault for the child’s problem. Older children may also feel guilty as if cancer is somehow their fault. Psychologists, social workers and other members of the cancer treatment team can be of great help in reassuring and helping them with their feelings. The cancer treatment team can guide patients and their families through the pain, uncertainty and disruptions caused by cancer. If necessary, the cancer treatment team can also contact or visit the child's school to explain the child's diagnosis to teachers and classmates. Replacing fear and misunderstanding with compassion and information is a much-valued goal in helping children with cancer cope with the illness. 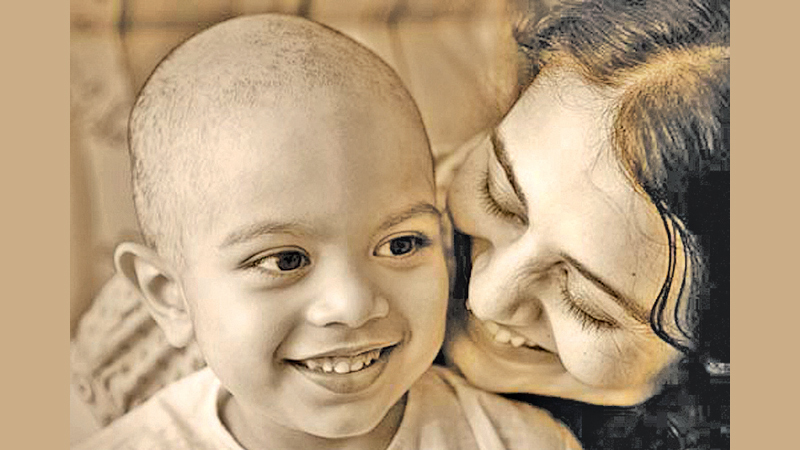 Both parents and the affected-child need extensive support to enable them to go through the harrowing times of the treatment of any form of cancer. The financial implications for the affected families too may be quite significant. Although many of the treatment modalities are provided free, occasionally some special drugs may need to be purchased by the parents. In addition, the work of parents and their earning capacity could also be significantly hampered by the child’s disease. Approximately 300,000 children are diagnosed with cancer every year. With high-quality care available in developed countries, over 80 percent of them survive. However, in the low and middle-income countries, the survival rate is only around 20 percent and 90 percent of the deaths from childhood cancers worldwide occur in low-resource settings. February 15 has been designated as the International Childhood Cancer Day by the World Health Organization. This year’s theme is “No more pain; no more loss”. It is envisaged that there will be concerted efforts undertaken to address these vastly different mortality statistics.